Can you tame the American Wild West? An epic town and resource management adventure awaits you! 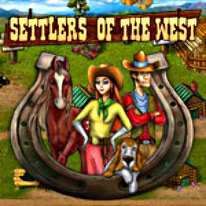 Settlers of the West is a city building playground set in the 1850's American frontier. Tame the wild west from the comfort of your couch as you decide what buildings your settlements need from mines, saloons, to farms and many more! Move in settlers and various pack animals like mules, horses and oxen. Hire workers to a variety of jobs: farmer, miner, a researcher to unlock new technologies, or a doctor or sheriff to help with western hardships and more!